Two weeks ago, my husband, Kiara and I went to Semarang, Central Java. Because we have no family or friends there, we had decided to stay at a hotel. After comparing some hotels, we booked a room in Pandanaran Hotel for three nights. We chose this three-star hotel because it’s located right in Semarang’s heart. It’s near everywhere! At least, there are taxi, becak (rickshaw) and angkot (cars for public transportation) come and go on the street of Pandanaran. But in consequence, it’s been always pretty noisy due to the traffic, even when you are at third floor like we did. We stayed in Superior Deluxe Room number 322. Regardless that little noise, Kiara, our 1 year old sweet heart, could sleep well when it was time. She wasn’t fussy. In fact, when we first arrived in the room and put her on the bed, she repeatedly smiled. Maybe because it was more comfortable than her own room in Surabaya? Ha-ha, don’t mention it, girl! My husband, like usually, made use of free wi-fi in the room. “The internet is fast,” he said. “Not excellent. Just fast. And stable!” Yes, FYI, three days we were there, the connection was never slowing down. Good for the guests. And me? What were I doing when in the hotel? Sometimes, I cooked. But not cooking as I always did at home. I just boiled the water using water heater to make coffee, tea, and Kiara’s meal. Beside wi-fi and tea/coffee maker, our room in Pandanaran Hotel provides a laundry service, LCD TV with 54 channels, Android TV, and refrigerator. There are also fitness center, spa and massage, swimming pool, etc as facilities for the guests. I love its swimming pool, by the way. It’s at the same floor with our room. The pool has a cozy ambiance. Not crowded, be on the week-days or the week-end. The water is crystal, with small amount of chlorine. Unfortunately, the main pool is only one meter deep. But the important is, Kiara was very enthusiastic when we brought her plunge. We really had fun! After traveling around Semarang under the suffocating sun, this place was like a safe house to us. But after about 15 minutes in the water, Kiara trembled with cold. That was a cue to end this fun. We back to our room. I hurried bathing her with hot water. We did not get bathtub, just a shower. Honestly, I want a bathtub like we had in Panghegar Hotel. But we ordered only the superior room, so that was we got. Over all, in my eyes, Pandanaran Hotel has performed a good hospitality, from the office boys, receptionists, to securities. This hotel was also clean. I think their service was pretty suitable with the rate. A Superior Room in Pandanaran Hotel is currently IDR 700,000 per night, Deluxe is 800,000 IDR, Grand Deluxe is 900,000, Executive is 1,000,000, and single bed for Suite is 1,700,000. They all exclude 21% service charge and government tax. If you need an extra bed, you must pay the extra cost too, about 225,000 IDR. 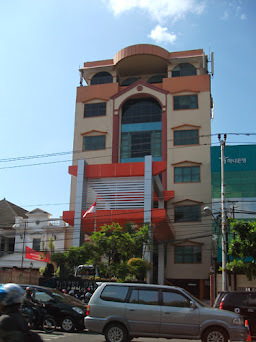 From the outside, the building of Pandanaran Hotel is not unique. From the inside, the view was also too banal, just Pandanaran Street and other buildings (or its swimming pool if your room is in other side). Happy Holidays! However, why take holiday in Semarang? What’s up?